It has become an addiction to visit Johor Bahru once every few months ever since the causeway Neighbourhood has become such a hipster hang out. Just three months from the last visit where we checked out FOC, plenty of new cafes and ice cream shops have opened its door to compete for the favours of the cafehopping crowd. There are many worth checking out, but there's one that forever remains my favourite because of its super yummy food, and that is The Replacement Lodge and Kitchen. Firstly, it has a really nice interior that is pleasant to the eyes - white walls, marble tiles, wooden surfaces and potted plants, everything that makes a perfect background for a photograph. Secondly, the service team is always friendly and willing to help, which makes the experience even better. More than that, the food and coffee are fabulous. We will never leave this place without gobbling down the Breakfast Platter. I mean, every single element of this platter was just so delicious! The sausage, the toast, the eggs, I have to stop here. And psst it costs 28 bucks.... in ringgit. Another dish that always left me in awe each time would be the B&B French Toast. Seriously, it is very rare to find food delicious to the extent that it gives an overwhelming sense of happiness, but this is one of them. 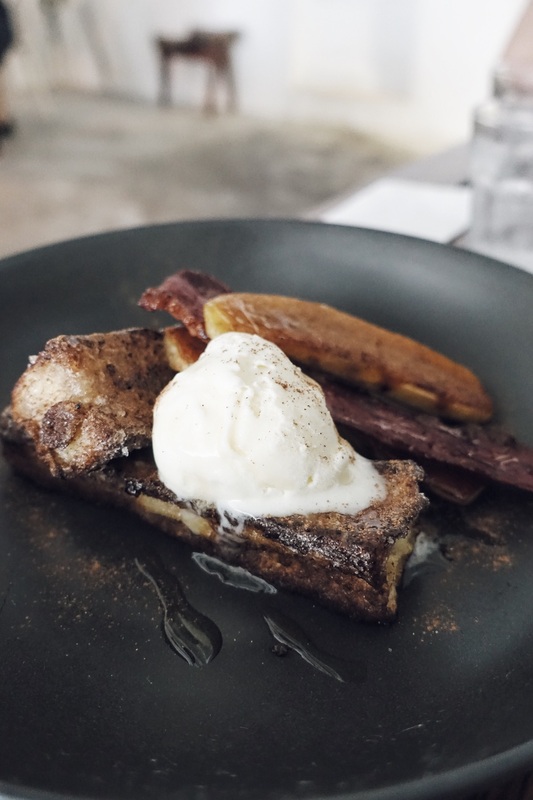 I don't know how they do it, but the French toast was just so crispy with every bite it crackled, and I wouldn't feel "gelat" finishing the entire dish on my own despite it being fried. The ice cream that went with it is just perfect, and another very important element would be the caramelised banana, sweet and fresh. This will definitely please all sweet toothed patrons. The coffee is also beyond my expectations. I get a little wary tasting coffee in other countries but The Replacement proved me so wrong. Their blend was really balanced and full bodied with a nice kick. I can't help but get a Piccolo every time I visit.